In the main event of ONE: WARRIOR KINGDOM, reigning and defending ONE Women’s Atomweight World Champion Angela “Unstoppable” Lee of Singapore retained her title with a dominant striking performance, unveiling a new dimension to her evolving skillset by putting together dynamic combinations to stun her opponent Jenny Huang of Chinese Taipei. Lee overwhelmed Huang from the beginning of the bout, peppering her with a volley of punches, elbows and knees. Huang tried her best to weather the storm but Lee kept coming, stalking Huang to no end. By the middle of the third round, the champion had the challenger pinned down on the mat as Lee unleashed ground-and-pound to earn the stoppage. In the co-main event, local hero Shannon “OneShin” Wiratchai sent a message to the lightweight division, asking for a shot at the ONE Lightweight World Championship belt after easily taking care of debuting opponent Richard Corminal of the Philippines. Wiratchai, one of the most dynamic strikers in the promotion, put his world-class boxing skills on full display, staggering Corminal with punishing lefts and rights against the cage fence. The end came fittingly as Wiratchai connected on a right hook that turned the lights out on Corminal. Top strawweight contender Joshua Pacio of the Philippines and former ONE Strawweight World Champion Dejdamrong Sor Amnuaysirichoke of Thailand fought to near exhaustion, pushing each other to the limit over the course of an intense three round bout. Dejdamrong stalked Pacio all throughout the ONE Championship cage while his younger opponent looked to take matters to the ground. Once on the mat, Pacio dominated Dejdamrong, keeping the Thai fighter on the canvas with high-level wrestling. Action continued in the second round as Pacio continued to batter Dejdamrong, even scoring on an emphatic slam. In the third round however, Dejdamrong came to life and started to pressure Pacio with his world-class Muay Thai combinations. Both fighters were able to make it to the final bell with Pacio being awarded a close split decision for his efforts. In one of the most exciting matchups of the evening, Yodsanan Sityodtong of Thailand and Ramon Gonzales of the Philippines put on a spectacular showcase of aggression to the roar of a packed crowd. Sityodtong, a former boxing world champion nicknamed “Little Tyson”, is known for his very powerful fists. Gonzales used takedowns to stay away from Sityodtong’s power, but spent a lot of energy trying to pursue a guillotine choke that Sityodtong was able to escape from. In the middle of the second round, the two fighters engaged in a skirmish at the center of the cage which left Gonzales unable to continue. Sityodtong earned the submission via verbal tapout after Gonzales signalled to referee Yuji Shimada. On the other hand, Thai-Japanese female atomweight prospect Rika “Tinydoll” Ishige brought her hometown crowd up to their feet with a spectacular performance, besting Malaysian fighter Audreylaura “Ice Comet” Boniface to win by technical knockout before the end of the first round. The two women wasted absolutely no time at all, going to battle at the center of the cage with a scintillating striking exchange at the sound of the first bell. Once the fight hit the ground however, Ishige’s grappling skills took the spotlight as she stifled Boniface with a series of submission attempts. In the end, Ishige wound up in full mount and finished the fight with ground-and-pound. Sagetdao Petpayathai of Evolve MMA was successful in his ONE Championship promotional debut, defeating game challenger Kelvin Ong of Malaysia. The local Lumpinee Stadium Muay Thai legend lit up Ong with his powerful striking, tagging the Malaysian with lightning quick kicks and thudding punch combinations. After a brief feeling out period, Petpayathai opened up his hands and drove Ong against the cage fence where he unleashed the fight-ending sequence to clinch the victory by technical knockout. 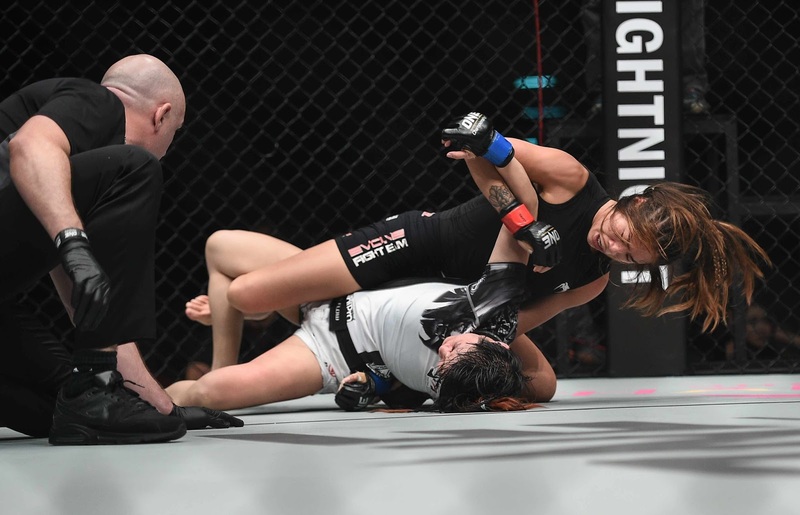 Featherweight fighters Ma Jia Wen of Tianjin, China, and Yohan Mulia Legowo of Solo, Indonesia, went head-to-head with intense striking tirades as well as high-level wrestling and grappling. Known for his fast and furious starts, Ma went straight at Legowo and opened up with a fierce punching combination, punctuated by a high kick that landed right on Legowo’s temple. In the second round, Ma turned up the aggression once again and began to tee off on Legowo, connecting on a devastating stream of punches and elbows to force the stoppage. In the second preliminary bout of the card, Thai wrestling champion Kritsada “Dream Man” Kongsrichai of Thailand delivered a sensational performance, forcing opponent Adrian Matheis of Indonesia to succumb to strikes in the very first round. The two strawweights went on the attack as soon as the bout began and although it was Matheis who landed the more telling blows, it was Kongsrichai who put his world-class wrestling chops on display. The end came when Kongsrichai wound up on top and homed in a series of elbows to force the referee stoppage. ONE: WARRIOR KINGDOM got off to a great start when feisty strawweight contenders Rabin Catalan of the Philippines and Pongsiri Mitsatit of Thailand locked horns to the delight of the capacity crowd. After a few brief exchanges both on the feet and on the ground, local fighter Mitsatit was able to deliver a series of knees to Catalan’s midsection which proved too much for the Filipino to overcome, earning him a thrilling technical knockout victory in the very first round.